It remains inconclusive how backyard chicken farming went from an obscure hobby to a mainstream passion that is driving people towards having their own backyard farms even in urban setups. Oh yes, it is not uncommon to hear the rooster crowing in the middle of the city these days, thanks to these dainty little chicken colonies. Some call it the demand for locavore food while others pin it to the rising need and awareness about the potential hazards of industrial farming. Irrespective of the motivation, backyard farms are thriving. Chances are that the succulent free-range and organic chicken leg that you picked up the other day was bred a few meters away from your home. Each day, I receive numerous emails from want-to-be farmers enquiring about the essentials needed to get started with their own farms. Well, the most important part of the equation is a chicken coop. A sanitary and spacious retreat for your chickens to retire to, at the end of the day, with a possible place to perch and nest safely. And the sky is the limit here. You have everything from barebones models to high-end swanky coops that can put an upmarket dog kennel to shame. But you don’t necessarily need a bank-breaking model for your farming needs. If this is the first time you are venturing into chicken coop shopping, then here’s a small guide that will help you get started with your purchase. Everything said and done, here’s my pick of the best chicken coops for sale in the market currently. I have been growing chicken for years now and I have dealt with my share of gimcracks. These coops have been picked after careful analysis of their space, features, ease of access, maintenance, and their customer ratings. Every product on this list has a minimum of 85% positive customer reviews. How many hens do you plan to keep? Are you aware of the town ordinances? What do the chickens need? Nobody said that a chicken coop had to look mundane. This Snap Lock backyard hen house from Formex is a beautifully designed one. So much so, that you may just be tempted to keep this inside the house. 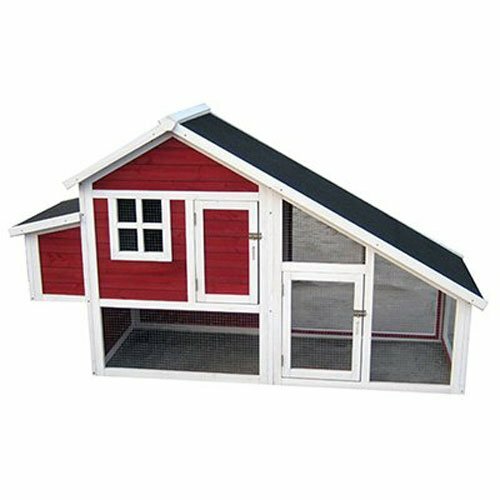 It is shaped like a dog-house and features a dual tone exterior in subtle but attractive colors. But the reason why it features on the top of our list of best chicken coop design goes beyond its stunning good looks. Out of the box, the Formex Snap Lock backyard hen house stays true to the name. It can be just snapped-on together in minutes and you will not need to fiddle for hours with tools to get it set up. You will be surprised at how light the coop is. It is made of blow-molded plastic and it weighs just under 40 pounds. So, even if you need to move the entire coop to a different part of the backyard, you can do it without seeking assistance from another person. Despite the lightweight profile, the coop is as durable as they come. The plastic does not crack or peel and is perfect for all kinds of weather conditions thanks to the insulating double walled construction. Lay some straw in it for the winters and it stays warm. On sweltering summer days, let the ventilation do the job. By the way, the ventilation is completely adjustable too. The product is 100% predator safe without compromising on the ventilation. It has lockable access which will ensure that your chickens stay safe at all times. At the same time, it is designed for easy access. 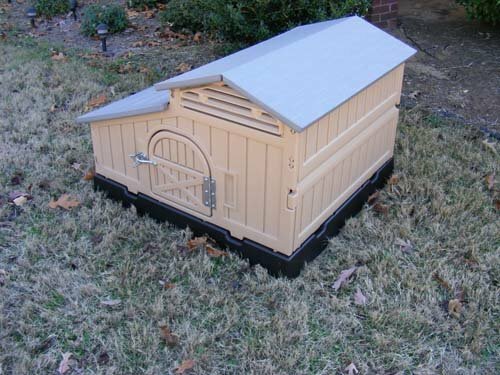 The hinged roof gives you access to the nesting boxes without disturbing the hen. Also, there is a removable litter tray that catches the droppings, feathers, and dirt making the coop extremely easy to clean. The coop is available in two different sizes. 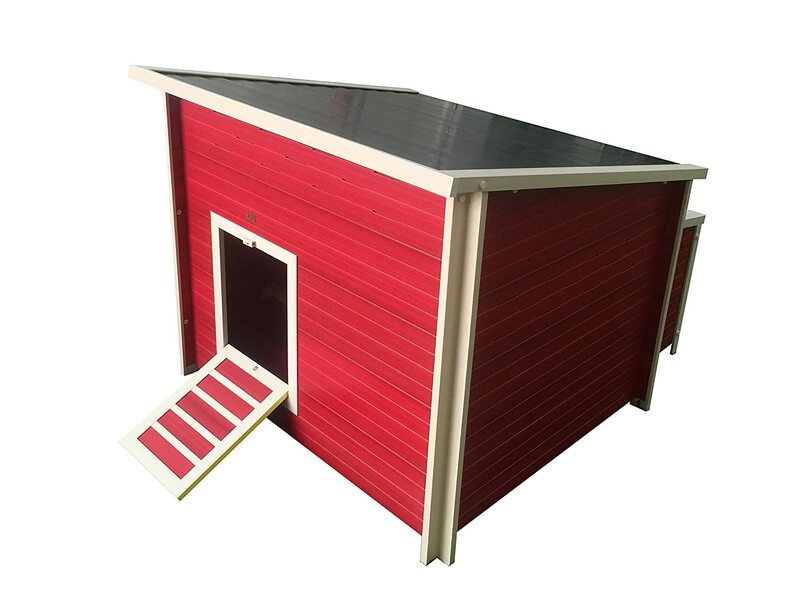 The smaller sized one is spacious enough to house 3-4 Large chicken and the large sized one can be used to house up to 12 standard sized hen. Verdict: Formex Snap Lock backyard hen house is manufactured in the USA and has been used by chicken farmers in a variety of weather conditions. 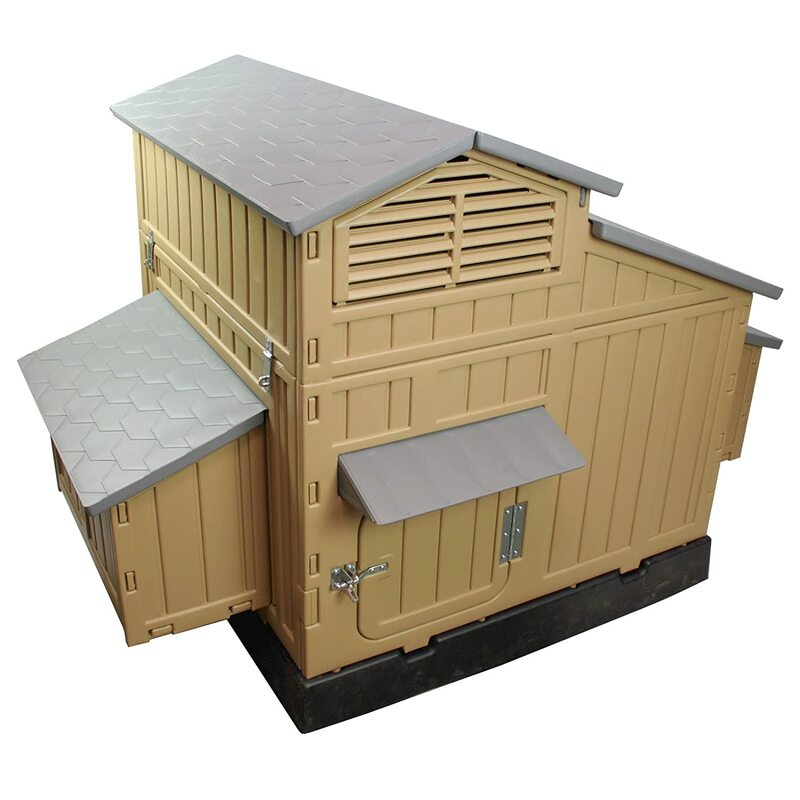 It is extremely durable, low on maintenance and roomy enough for a backyard farm. If you are looking to start with a bigger flock, then you must take a look at the Duplex Chicken Coop from Trixie Pet Products. Like our number one pick, this one will grab eyeballs too. Let’s say I am a sucker for beautiful designs. But hey, I am sure nobody likes a product that looks like an eyesore in your backyard. This chicken coop is everything you need to raise a flock. 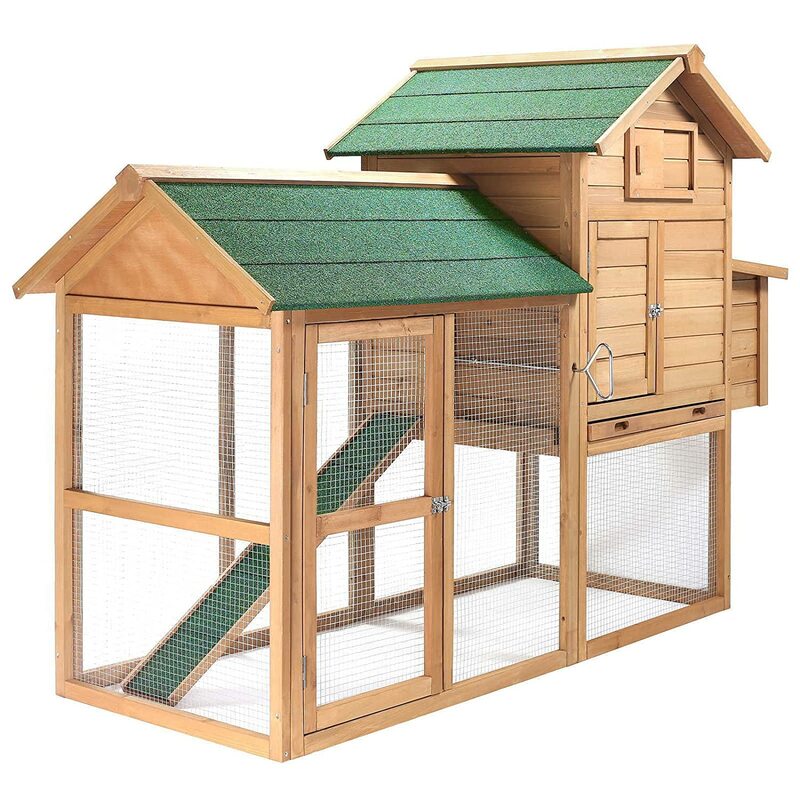 It comes with an outdoor run, roosting poles, ramps and nesting boxes. Club this with a predator-proof design and you have a winner on your hands. Once you are done getting awed at the beautiful pine wooden finish and the green roof combination, you’d appreciate the roomy interiors that the coop has. The manufacturers advertise it as being the right size for 6 standard sized chickens. But it can easily accommodate up to 8. I am talking about the XL sized coop that is. The positioning of the roosting poles and the nesting boxes is immaculate. The fact that the removable cleaning trays are placed right under it makes the coop extremely easy to clean and maintain too. Also, the ramp gives chickens easy access to the roosting poles. Nesting houses feature hinged roofs for easy access to the eggs, removable dividers to prevent the eggs from getting broken by other hens and fixtures to secure the doors with padlocks. The padlock fixtures are not of the best quality though. If you are concerned about raccoons or weasels gaining entry after fiddling with the padlocks, you can easily replace them with better quality ones bought off Walmart. This is not a deal breaker when you compare the other features of the coop. Access to the interiors of the chicken coop is such an important part of growing healthy chickens. This product features both front and top doors which allow you to clean it easily from the inside. The outdoor run will prevent the chicken from running haywire in your lawn and pecking it bare. Verdict: The Trixie Duplex chicken coop is an ingeniously designed package. It will keep your chickens happy and will make life easier for the first time chicken farmer. You can pick from eight different size options too. SmithBuilt’s Two Storey Chicken Coop is the stuff chicken dreams are made of. As evident by the name, this is a huge coop that runs 7 feet long and features multiple stories. The upper one houses the residential quarters while the run is downstairs. Chickens can switch between the two while you can stay rest assured that they are protected from predators and the like. There is something about coops made from solid wood which makes them more appealing and also durable. This one is made from Solid Fir that has been coated for the outdoors. If there is much rain in your area, then I’d recommend that you treat it with an additional coat just to be sure. Despite the all-wood construction, two people can lift it off the ground to move it. Assembly may take more than an hour and a half considering that the multiple storied design comes with a lot of screws. The SmithBuilt 7 ft. wooden coop features a roosting bar that can hold up to three chickens at a time and a nesting box on the side which can be separated by a divider. Access to the nesting box is via a hinged roof that lifts upwards. The nesting box and the main living quarters are surrounded by a wooden enclosure that keeps the coop warm even on cold winter nights. The slanted asphalt shingles on the roof ensure that even the tiniest bit of rainwater doesn’t find its way into the coop. One of the things that I’d like to mention here is that some people mistake it to be 7 feet tall. No sir. This product is 7 feet long. In other words, it runs that long with the run included. The actual living quarters for the chicken is 26.25 long and 32 inches high. That more than suffices for three chickens. But if you feel its too cramped, you can use it for two full-sized birds. Verdict: The SmithBuilt 7 feet chicken coop is one of the best chicken coop kit on the market. The solid wood construction and the intuitive design makes it a great choice for backyard farmers looking for a ready to use package. The Fontana Chicken Barn is a very popular chicken barn thanks to its spacious interiors and durable construction. It is made from Eco-Flex, which is a combination of recycled wood and polymers. The material is incredibly durable and resistant to even the harshest of weather conditions. The Chicken Barn is designed for easy assembly and you should be set up in less than an hour. The Jumbo sized Fontana Chicken farm gives your hens a whopping 12 square feet of moving space. Even if you adhere to the mandatory 1 sq feet per bird inside the coop, you can easily house up to 12 standard sized chickens at a time or up to 10 ducks if you plan to use it as a duck house instead. The large interiors are perfectly complemented by two roosting bars and 3 nesting boxes which are divided by partitions. The Eco Flex material is one of the best ones for use outside the home since it does not absorb moisture or get warped, cracked or peeled. Customers have used it for years without as much as a blemish to show for it. If you live in an area with mild weather, then you need not worry too much about the temperature inside the coop. But if you live in an area with extremely hot weather or severely cold weather, then you’d be glad to know that the Fontana Chicken farm provides excellent insulation during winters and has multiple ventilation slats for the summers. During the rains, this prevents condensation from setting inside and your chicken will stay dry. And if you want to use a heater for the winters, the roomy interiors ensure that you can position it without hindering the movement of the chicken. Access to the interiors can be via the hinged lid for the nesting boxes or via the removable roof (it can be removed in minutes). Verdict: The New Age Fontana Jumbo chicken barn is a steal. It lets you accommodate up to 12 chickens and is designed to last for years without any damage to the exterior. Highly recommended! 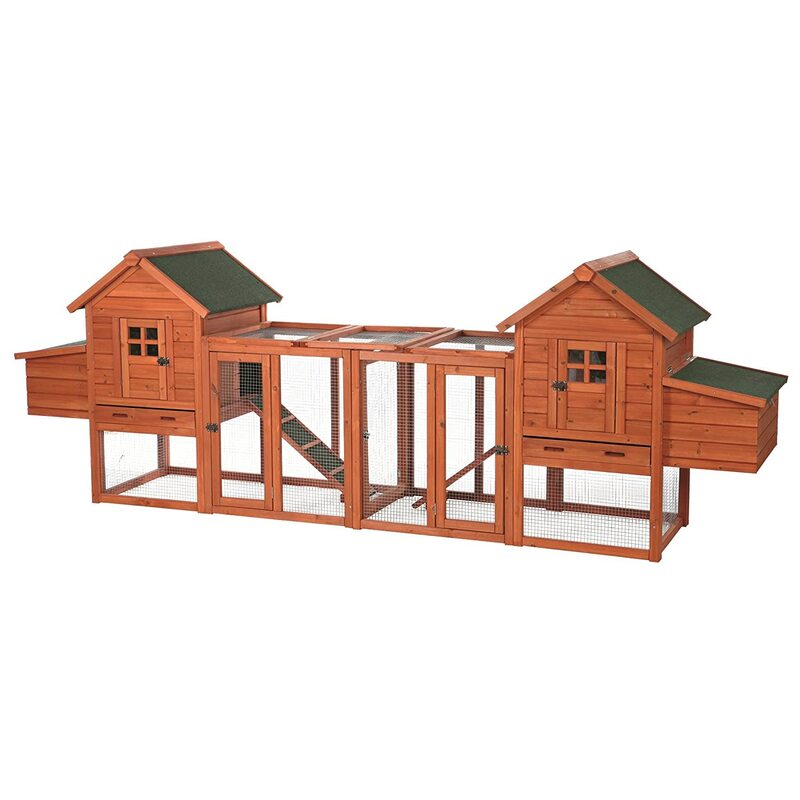 If you are looking for a coop and a chicken run combo that is perfect for about three hens, then the Merry Pet Habitat Coop should be a great choice for you. It is used by a lot of people in urbane setups due to its compact footprint and all-inclusive design which eliminates the hassles of buying and setting up a separate run. Also, it is secure and looks beautiful with red satin panels and a black roof. The Habitat coop for chickens is made from fir. I am not sure whether it is Douglas-fir, but it certainly looks like it. The wood is durable and does not warp or peel after moisture and sun exposure. Despite the many parts included in the package, assembly is fairly simple. The package also includes a few extra sets of screws just to ensure that you don’t misplace anything. It should be completely set up in a couple of hours. Access to the coop is relatively simple. A hinged roof lets you access the internal part of the coop and a slide out pan collects the droppings and feathers keeping the main coop clean and dry. Ventilation is excellent thanks to the multiple netted windows which provide ample air and light into the coop. This will keep the raccoons away pretty easily. The main access door has a latch. If you are paranoid about predators, then you can replace it with a sturdier padlock. The Merry Pet habitat coop for chickens also includes a roosting pole that is sufficient for two chickens and a large nesting box which can be separated by a divider into two boxes. The main area is connected to the run via a ramp which has horizontal slats for better traction as the chicken enters the coop. The metal wire on the run is durable and does not rust even with rain exposure. The openings are quite small and will keep snakes from entering the coop. Verdict: With an in-built chicken run, the Merry Pet Habitat coop for chickens brings unbeatable value to the table. It is durable and can hold up to 4 hens at a time. Great buy if you are looking for an all-inclusive choice. The chicken coop you buy will be a very important investment in your crusade as a poultry farmer. If you are an experienced farmer, then it goes without saying that you’d be aware of the essentials. But if you are new to it, then here are a few details that you need to be aware of. First and foremost, you need to decide how many chickens you plan to keep. If you plan to keep chickens to get eggs for the family, then three to four chickens can give you as many as 700 eggs a year. That’s specific to some breeds though. Rhode Island Red, for example, lays as many as 250 eggs a year per chicken. There are other breeds which lay much lesser. Also, as the hen ages, she will continue to lay fewer eggs each passing year. She will eventually stop laying when she molts. The number of hens you plan to keep will determine how large a coop you need. You should also take into consideration the amount of space in your yard that you plan to allocate to the coop. You also need to be aware of any restrictions that your town may have regarding keeping chickens. Some towns disallow roosters because of obvious reasons. Others have a limit on the size of the flock, the size of the coop and the location of the coop. Ensure that you are updated on these. There is a common misconception that chicken living in a backyard farm do not need protection from predators. Oh, you couldn’t be more mistaken. While coyotes may seem like a far-fetched proposition, there is a very real threat from raccoons and dogs. Also, hawks and owls will snag a chicken if given a chance. The coop needs to be secure and safe preventing these predators from gaining access to them in any way. Windows need to be covered as well. Other than this, they need to be protected from the vagaries of weather. You will need a waterer and an automatic feeder if you do not want to spend time manually spreading scratch. These additional tools will save you time and effort. But also consider the possibility that storing these in the coop may make it more cramped for space. People living in cooler climates may need to invest in a water heater. It is estimated that a laying chicken needs at least 1.5 square feet of space inside a coop and approximately 8 feet outside of it on the run. You may be tempted to cram as many as possible into a small coop. It will only lead to distress among the birds and they may start to injure each other. Also, more the room to move about, the happier the chicken. Now that you are aware of the essentials of starting your own backyard farm, here are a few features of a good quality coop. Chickens are messy. The coop will be covered in bird droppings, feathers, and dirt that is tracked inside. It is in your best interest to keep the coop clean. So, look for a coop that lets you access the insides easily. Most coops have multiple access points including a removable roof and a large door. You must also be able to remove the nesting boxes and the perches so that you can hose down the place from time to time. Look for one that lets you access the nesting boxes from outside. This will allow you to collect the eggs everyday without opening the coop and disturbing the flock. There has to be a minimum of two points of ventilation in a coop. Most coops have it positioned near the roof. This prevents a direct draught from blowing into their feathers which they absolutely despise. Lack of proper ventilation can cause a whole range of problems for your chicken. So consider this a very important feature. The nesting box is one of the most important features of the coop. Your chicken will lay at least an egg each day of the year except for winters. And they need a cool and dark place that is not disturbed frequently. It needs to be lower than the perches and give them easy access at any time. This will ensure that the eggs stay safe and the nest box remains clean. As I mentioned earlier, the nest box also needs to have external access to remove the eggs. There is nothing better than a good quality wooden coop. But the market is flooded with cheap Chinese wooden coops that will warp and crack in a few months. Ensure that you check the type of the timber and the thickness of the coop. It needs to be weather resistant too. The other options are molded plastic which is easier to clean and does not fade or chip with time. Last but not the least; the run is an important part and most coops will have a run built in. If your coop doesn’t have one, you can always order it separately. A chicken run gives the chicken ample space to move about keeping them safe from predators and it also lets you round them easily at the end of the day. That’s it, folks. I hope you enjoyed reading this and it helps you find a good roosting and resting quarters for your flock.